Wisenet is committed to improving it’s features from the feedback we receive from you on how we can make our product better. We have a common process of testing some behind the scene features that will enable us to make updates and improvements more rapidly and efficiently for you. 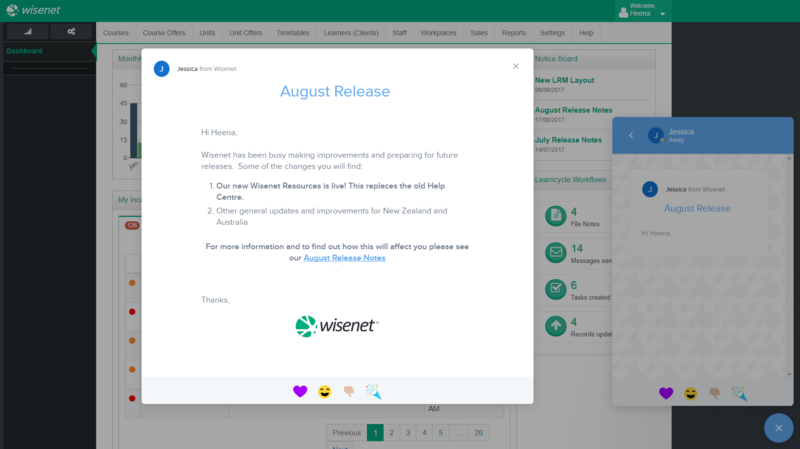 Periodically when a release occurs we will communicate the changes to you via a Pop-Up Notification when you log into Wiseset and/or via Email. Detailed Release Notes can be found in the Notices section of our Resources site. Release Notes explains the purpose of the Release, any bug fixes you need to be aware of and details about what has changed and/or improved. Keep reading below to find out more detailed information about Wisenet Releases. 1.0.0.1 Which version of Wisenet LRM is my Training Organisation using? 1.0.0.2 How do I update my Wisenet LRM database? 2.0.0.1 What happens during a release? 2.0.0.2 How often does Wisenet do a release? 2.0.0.3 How does Wisenet communicate releases? 3.0.0.1 How do we prioritise what is released? Which version of Wisenet LRM is my Training Organisation using? All Wisenet users are always on the most recent version of Wisenet. As such, we do not have version numbers as we release any changes and enhancements to all users at the same time. How do I update my Wisenet LRM database? You don’t have to do anything – we do all the hard work for you. We will communicate details about the release. You and your team will automatically have access to the updates the first time you log in after the release date and time. What happens during a release? How often does Wisenet do a release? Generally, we aim to do a release once every 8-12 weeks. Sometimes it’s more often, sometimes less often. How does Wisenet communicate releases? We’ll send you a message inside your Wisenet LRM App. Simply click on the BLUE Message Bubble Icon (at the bottom left corner of your screen) to view notification. Click on the following image to see an example of an In-App Notification. How do we prioritise what is released? We use an agile development and release model. This means that we analyse the requirements, develop the design, then do extensive testing prior to the release. Using this model, we can sometimes add in additional features and enhancements earlier than planned. Occasionally, it also means that we may identify some features take longer to develop than anticipated. If this is the case, we will communicate this through our release lead up period. We welcome suggestions and feedback on how to make our Learner Admin and Integration Platform even better. Please log a support request outlining your ideas and we will be happy to consider them. We will give priority to suggestions and feedback that will benefit a wide number of users – as such, we may not be able to accommodate requests that are very specific to your organisation. Please note that our development process includes analysis, prioritisation, design, testing and launch stages before a new feature or enhancement becomes available. This means that we can accommodate some requests very quickly, whilst others may have a very long development process. In addition, changes to compliance may mean that we need to put some development ideas on hold until these are deployed.